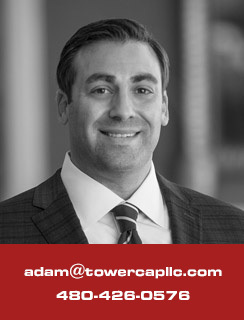 Prior to founding Tower Capital, Adam served as Vice President at Johnson Capital, one of the country’s top real estate capital advisory firms with 20 locations nationwide. There he was involved in the successful placement of over $360 million in bridge and permanent structured financing on behalf of commercial real estate investors and property owners throughout North America. Prior to Johnson Capital, Adam was with Travers Realty Corporation, a regional commercial real estate brokerage firm headquartered in Los Angeles. At Travers, Adam was one of the founding agents of the West Los Angeles office. He subsequently took the position of Designated Broker and Managing Director for Travers’ Phoenix office. During his tenure, his Arizona team completed over 500,000 square feet of leasing and sale transactions for local, national, and international clients throughout the state. Adam began his real estate career with Levrose Real Estate and Investments, a boutique commercial brokerage firm located in Scottsdale, Arizona. At Levrose, he negotiated over 300 commercial real estate transactions which included office, industrial, and retail properties. In 2014, Adam earned the designation of Certified Commercial Investment Member (CCIM), a title held by only a small group of elite commercial real estate investment professionals. He is actively involved with the Urban Land Institute (ULI) and National Association of Industrial and Office Properties (NAIOP). Adam graduated from Arizona State University with a degree in Business Administration and Communications. He holds a Real Estate Broker’s License in Arizona and a Sales License in California.